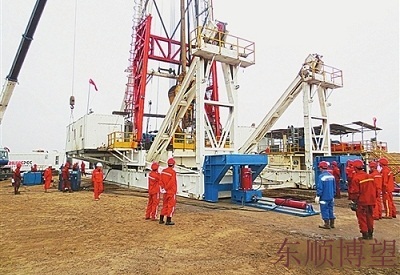 ZJ50D rig adopts advanced SCR drive technology, 3 units of 1310 kw diesel generator set as the main power, the 50 hz, 600 v alternating current (ac) after ark of SCR rectifier into a 0-750 - v dc, respectively, driving power for the winch, rotary table and mud pump series dc motor; Winch driven by two motor; Rotary table by 1 electric motor driven by independent; 2 sets of mud pump driven by two motor. Winch main brake for the hydraulic disc brake, auxiliary brake for DSW50 water-cooled electromagnetic brake. Before shedding derrick, screw type or double l type base. Using the winch power, hoisting in place.